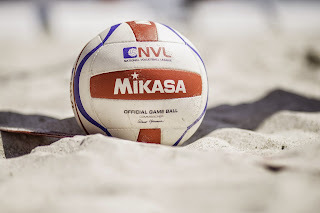 Top Beach Volleyball Bag Must-Haves! You want to be 100% focused on the court and I promise you'll be thinking about your aching skin and not the next point if you're sunburnt! I always bring 4 kinds of sunscreen: lotion, spray, a stick, and chapstick. You can never have too much! I apply the lotion before I even step outside (you should wait 15 min for it to sink in before you go out in the sun). Use the spray sunscreen in between matches as a touchup - not a primary. Remember only about 60% of the spray makes it on your skin, so lotion is much more economical and more protective. Then I like to use a stick on super high sweat areas - nose, forehead, tops of ears. Chapstick with an SPF is also important. You won't realize until the end of the day that your lips can get burned too. My favorite sunscreen is Australian Gold. It lasts a really long time, and well, smell it! You'll be hooked too. 2. Ball... Always have a ball with you! Tournament directors often only provide balls for the court and not for warm-ups. It's important that you start warming up for at least ten minutes before your court opens up. Make sure you run, stretch, and pepper so you and your partner are ready to start using the net as soon as the match before you is over. I always have a beach towel with me for stretching, getting sand off my face, or for a post-VB swim in the ocean. My brother and his wife bought me a special one a few years ago that I bring to every tournament. I draw a lot of strength from my family and I bring a few momentos with me when they can't be there. Little reminders of my family makes the good days that much better and the frustrating days a little less bad! Make sure you thank your parents and other family members who come out to watch you. You will miss them on the days they can't be there. No matter if you lose or have the worst match of your life, a classy player always walks off the court with their head high and thanks their fans who came out to see them. I like to bring a yoga strap to stretch in between games. It's a really easy, low energy way to get in a good deep stretch while relaxing. Try laying on your back with one leg in the air and the strap around your foot for a deep hamstring stretch. Or stand up and hold the strap overhead with both hands. While pulling out on the strap, squat down while keeping your upper body straight for an overhead squat. I also like to use a band as it helps to activate certain muscles that I need to "wake-up" before a game to help stabilize my bigger power muscles. A simple exercise is band pull-aparts, where you hold the band in front of you and use your arms to literally pull it apart. You should feel your upper back engaged and ready to crush some balls! Every elite athlete knows that proper nutrition is key in getting through long days and training sessions. I try to carry snacks that can last through the day. Almonds, protein bars (remember to keep them out of the sun so they don't melt! ), bananas, and dried fruit (no sugar added!) are great options. I also like to use all natural recovery or electrolyte drinks (check out VegaSport Recovery powder) when I know I will be sweating a lot. I make sure to bring plenty of everything because I don't like to eat big meals during the day when I play, but I do eat a little something between each match. Big meals make me sleepy! Make sure you have a couple of water bottles on tournament day. Many tournament directors offer water, but you definitely don't want to be stuck without if there isn't any. I like to bring at least two water bottles so I can mix my electrolytes in one. I also prefer stainless steel water bottles as I think they stay the cleanest. Plastic bottles often have BPAs that can leak into your water when the bottle is in the sun, so if you do have a plastic water bottle, make sure its BPA free. Klean Kanteen makes a really good stainless steel water bottle. I like having a lightweight hoody on hand, especially when I'm outside all day. It's a good idea to physically cover up as much as possible when you aren't playing in order to protect your skin. I can't play in a hat, but I do wear one in between matches to protect my face. A cool trucker hat is a must on the beach! 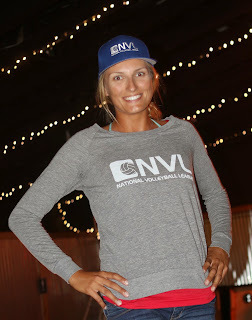 Check out the awesome merchandise line coming soon to www.thenvl.com to stay protected (and look cool!) throughout the day. You never know when something might happen! Something might rip, you might spill, or your bikini or boardies might just feel funny after playing 4 matches. Whatever the reason, it's always a good idea to bring a uniform change. It's really important that you try your bikini or boardies on before tournament day. Make sure they fit well! Jump, squat, shake it out... make sure everything stays in place and is comfortable. Just because it looks cool doesn't mean it's comfortable. 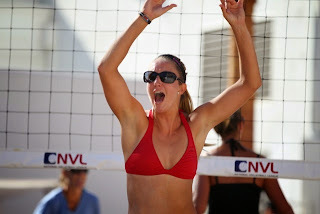 You definitely don't want to be distracted when you are on the court. For the ladies, I really like adjustable bikini tops - Pepper Swimwear makes a great top that has four adjustable straps. They are also reversible so it's like you can get two different looks in one. Sports bra and cross back type tops are also great. I highly recommend you avoid string bikini halter-tops or bottoms! Nothing stays in place. (Yes...I have learned the hard way). I always need music to pump me up before a game so I never leave home without my ear buds! It's just as important to mentally warm up as much as physically warm up. I like to visualize the first play of the game as well as get rid of any "noise". Noise can be anything from being too excited to doubting yourself. You need to find the right level of emotion and shake off anything that is making you too anxious. If you are at practice, you need to prepare yourself to learn, and if you are at a tournament, it's time to let all of your training and hard work kick in! It's GAME TIME!